← Caroline Groves, Couture shoe and bag maker, or artist? Justin Fitzpatrick, The Shoe Snob super-blogger, has travelled a long way from music executive to shoe maker. Seattle born and bred, Justin attended the University of Washington where he studied Entrepreneurship, with the intention of going into the music business. Unfortunately for Justin but fortunately for shoe connoisseurs, that didn’t work out and the music business’s loss is the shoe industry’s gain. Justin is particularly interesting as he is completely self-made. 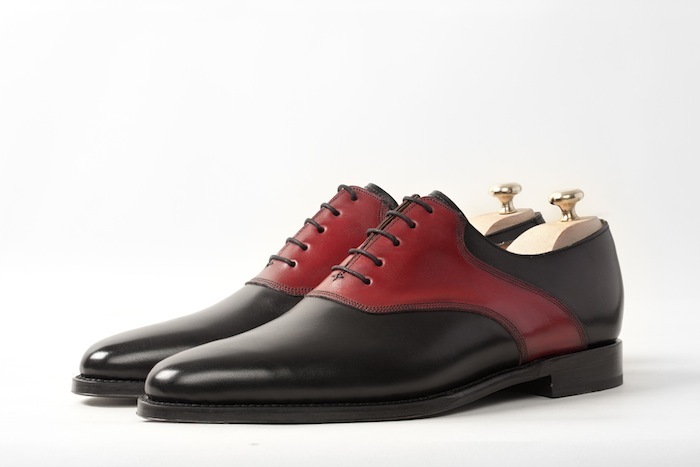 He went from Nordstrom college job in his Washington State hometown, via Italy, where he learned how to make shoes from the great Stefano Bemer, to London where he now has his own shoe line. It is a remarkable story, of passion, determination and ability. We met up at Starbuck’s to talk shoes. Justin’s approach is refreshing and forthright; he is an advocate for high-quality men’s shoes, writes about them and makes them. His blog has enormous reach and is probably the most-read men’s shoe blog in the world, with over 100,000 visitors each month. That’s a huge number of visits. It is very, very popular and is regularly referenced on Styleforum, probably the most influential style site in the world. If you visit The Shoe Snob blog you will see the most extensive and eclectic collection of shoe pictures to be found anywhere on the net. Justin has posted thousands pictures of shoes since his blog started in 2010. He is also opinionated and not afraid to take on the perceived wisdom of the trade – look up his article on gemming for an excellent example. It’s Justin’s unique mixture of visuals and direct, unambiguous prose that makes his blog so compelling. No dissimulation, just the unvarnished opinion of a knowledgeable and direct man, with a good eye for what makes an attractive shoe. When asked about his favourite Foster’s shoe Justin came up with two (typically Justin, if you ask us), one each from the ready-to-wear and bespoke collections. 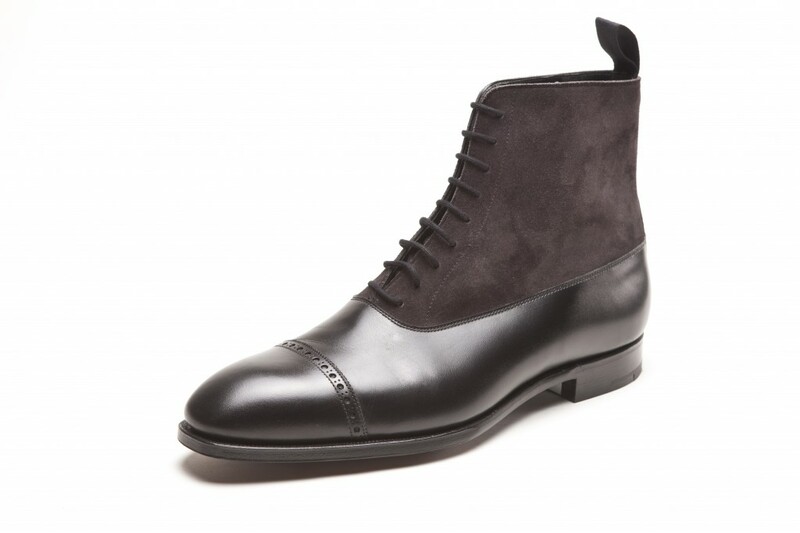 His ready-to-wear favourite is the Montrose in black calf and grey suede, a shoe I happened to be wearing when we met. 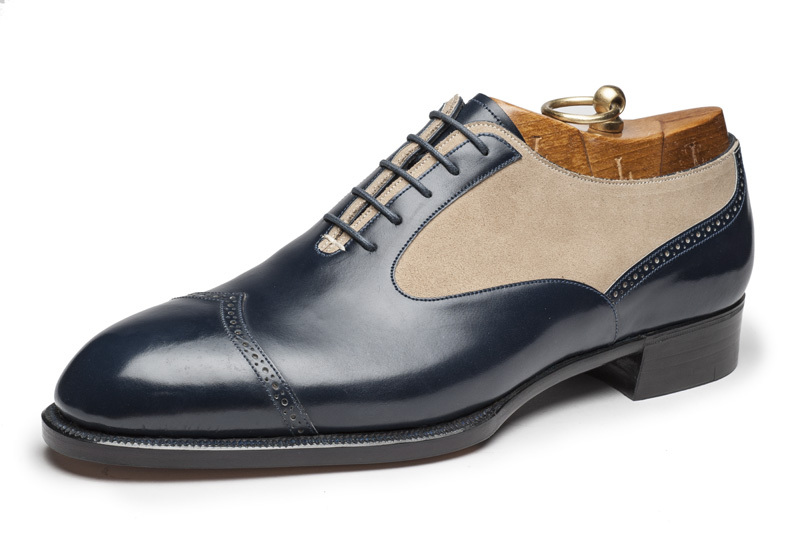 Justin’s favourite bespoke shoe is this one, made in the Art-Deco tradition. 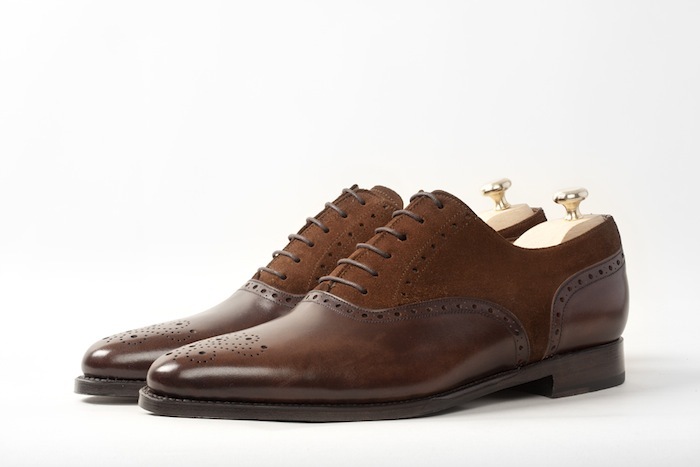 Interestingly, both shoes (the Montrose is actually an ankle boot but…) are heritage designs and both hark back to the early years of the 20th Century. We talked about this briefly and agreed that there’s nothing in shoe design that is completely new. Each generation builds on the successes and failures of the past. Justin’s approach to customer service is refreshing. If he doesn’t stock the shoe you want he’ll point you to someone who does – with a smile on his face. He’s a normal guy, driven to be sure, but normal. His goal in the shoe business is to have shops in London, New York and Tokyo. Given how far Justin has come in such a short time we wouldn’t bet against him. You can meet Justin at Gieves and Hawkes, No 1 Saville Row, where he has his Shoe Snob concession. If you’re not subscribing to his blog already, you really should, it’s at www.theshoesnobblog.com. We hope to have a regular post from Justin; he’s a man worth watching. We wish him all the best. The shoes below are our favourites from Justin’s own collection which you can buy either from his online store or in person at Gieves and Hawkes. This entry was posted in Shoes we like. Bookmark the permalink.